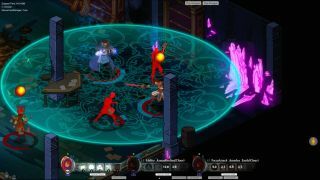 We first encountered Masquerada: Songs and Shadows, “an RPG about masks and magic,” in early 2015. It caught our attention with a bright, colorful isometric visual style, and its real-time-but-also-pausable combat, which we took a closer look at last August. It was originally slated for release this spring, but developer Witching Hour Studios is hoping that a Kickstarter campaign will enable it to spend a little extra time on the game, to “add the final touches." Because of that, it's taking a run at Kickstarter to secure sufficient funding to really tie it all together. “With your money, we’re going to continue iterating on the hundreds of combat encounters in the game to ensure they are balanced in a deeply satisfactory way for all skill and character configurations. And we’re going to throw more tweaks and layers at our visuals, so that things don’t just shine, they’ll be eye-popping,” the studio wrote. The campaign goal is £45,000 ($65,000), and it's running for an unusually short period of just 14 days: Witching Hour said most Kickstarters are funded in their first and last three days, so it “decided to go with something shorter and punchier to really get the best out of our time.” The campaign comes to an end on May 5, and if it's successful, the game is expected to be ready for release this summer. For now, you can try a free demo of Masquerada: Songs and Shadows on Steam.